Analytics are propelling health care systems into greater IT adoption, with IT experts working alongside administrators and practitioners to determine the organizational needs. Hospital administrators are leading the use of health care analytics for a range of functions in provider settings. Driving their increased use are a few key clinical and business factors: the desire to meet meaningful use requirements, create quality reports, and better capture revenue, according to the results of SearchHealthIT.com's business intelligence survey. 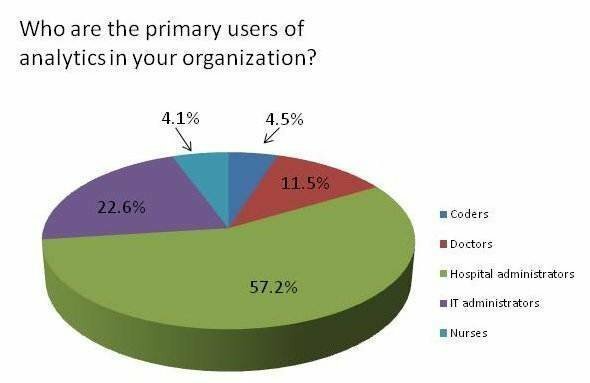 Results are based on 243 responses from CIOs and other senior IT executives at medical centers, health systems and physician practices across the country. The survey was conducted online in August. For the purpose of the questions, business intelligence was defined as analytics used for administrative, back-office functions while clinical data pertained to information found in clinical, patient-facing situations. Clinical data analytics and business intelligence applications are important to hospitals as they expect to increase some spending in the next two years on new tools for areas such as supply chain management, health information exchange (HIE) and predictive analysis of disease. Administrators are working in teams with their IT department and other hospital staff in determining what to spend, and where to spend it, as BI takes on a greater role in health care. It all comes back to HIE, either within an organization or among various care settings and providers. The country is moving toward greater exchange as providers demand more information to care for their patients, according to Daniel Porreca, executive director of HEALTHeLINK. The Western New York regional health information organization (RHIO) links about 2,000 physicians, 16 hospitals, labs and radiology providers along with three major insurers in the region. Exchanging data builds the foundation for turning around and using that data in a variety of ways. But just putting technology in place isn't enough; health care practitioners have to feel comfortable using analytics and integrating those functions into workflow. That's where information exchanges can play a significant role, Porreca says. Collecting data, making it available in a useable way and providing tools for analysis are the three components of successful HIE. "We're not going to have quality improvement and cost efficiencies" without integration and a cultural shift. HEALTHeLINK, which connects several different electronic health record products through its HIE platform, recently began to participate in the Veterans Affairs Department's virtual lifetime electronic record (VLER) pilot, which aims to ensure the records of vets who receive care in both military and civilian settings are streamlined and maintained seamlessly. That goal of having records follow patients wherever they go is one ultimately officials and practitioners hope to see occur for all people, through a national information network. Meanwhile, regional exchange networks are filling the needs of providers and patients. That's going to continue to grow, Porreca says. "The strong commitment has been there, and I think the value is being realized." Explore the impact of business intelligence in provider settings, and the results of the SearchHealthIT.com reader survey, in this report. Like many industries, health care seeks ways to improve efficiency and reduce costs. 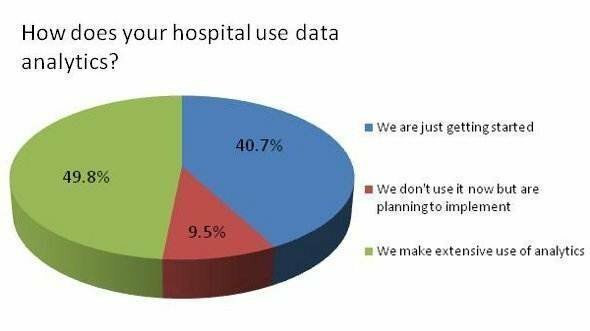 Hospitals are turning to analytical tools to help accomplish those goals, with 42% of survey respondents pointing to that desire as the driver for using such tools. On the other hand, more than half, 56.4%, say the desire to comply with federal mandates and create better clinical outcomes for patients are driving the use of analytics. While nearly half of respondents say they already make extensive use of analytics, hospitals equally are just getting started or are planning to implement data analytics. While mandates and economics are driving health care to use analytics, what they use those tools for also becomes more important. 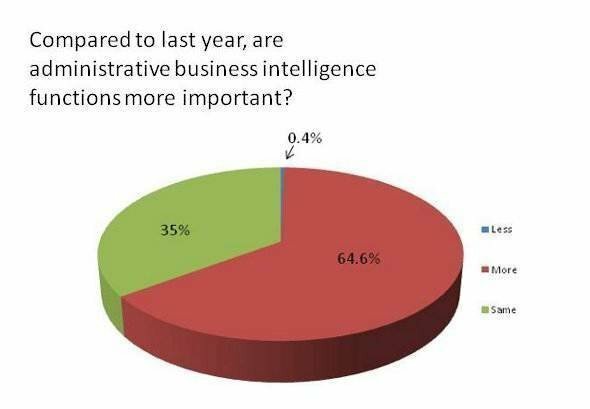 Administrative business intelligence -- using analytics for back-end office functions, billing, and improving efficiencies -- is more important this year than last, according to 65% percent of survey respondents. 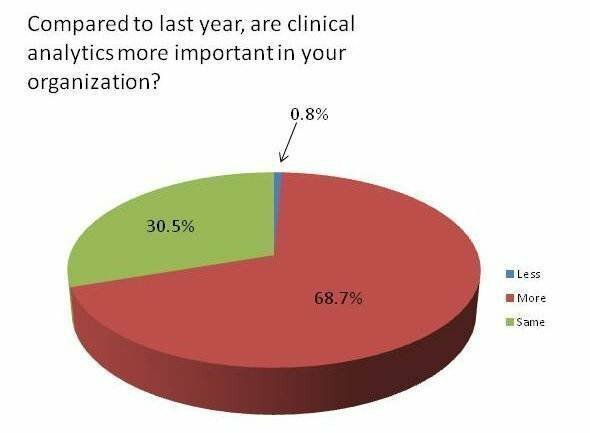 Some 69% of respondents, however, said clinical analytics -- using patient data to improve clinical outcomes, report quality measures, and identify medical and patient trends -- is more important compared to last year. 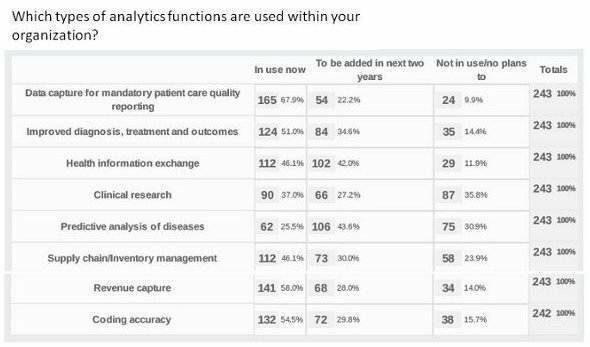 Analytics are applied to a range of functions within health care organizations, from clinical quality reporting to supply chain management. The next three graphs describe the types of projects survey respondents most likely are using analytics for. Expect analytics tools to be applied increasingly to projects such as predictive analysis and health information exchange in the next two years as federal mandates continue to be rolled out. 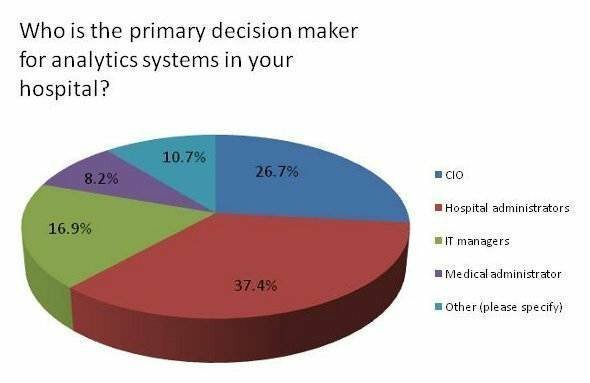 While survey respondents reported that administrators are the primary users and decision makers for analytics systems in hospitals, results indicate that -- like an electronic health record implementation project -- increasingly, it is cross-department groups that influence which systems are used and how those systems will be applied to workflow. 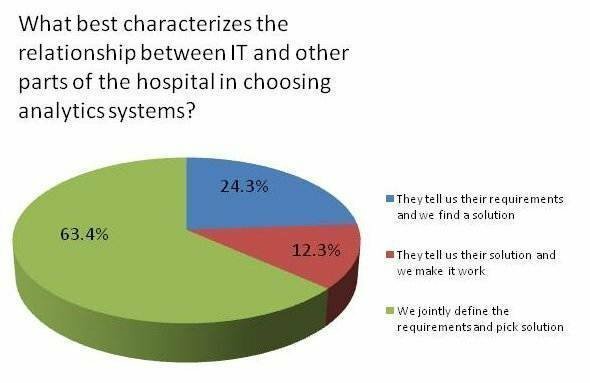 Not least important is a hospital's IT department, which plays a significant role in selecting systems and deploying them across the organization. 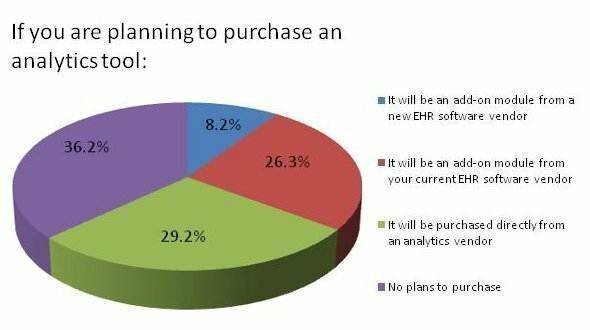 Hospitals in general believe they already have purchased the analytics tools they'll need to meet upcoming demands. 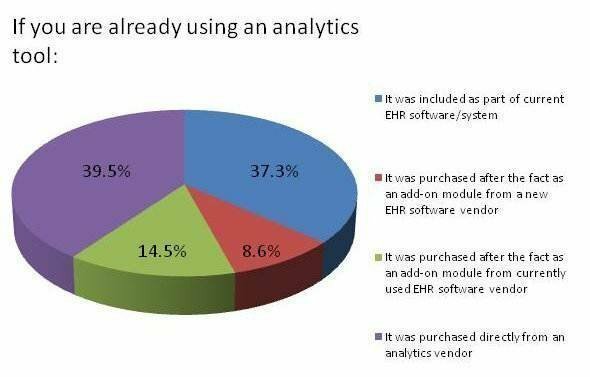 Most survey respondents said they either purchased analytics directly from a vendor (39%) or that the tool was included in the electronic health record package (37%). 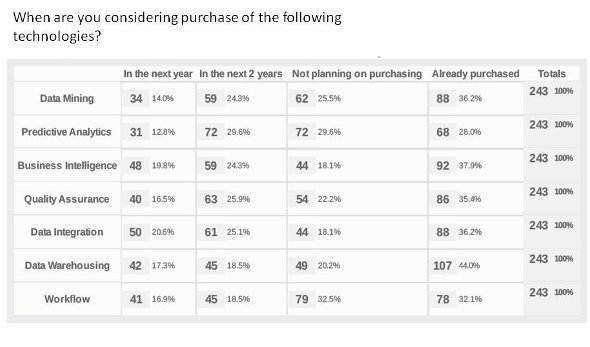 Of those planning to buy analytics tools, 29% said they will buy directly from an analytics vendor, compared to 26% who will purchase a tool as an add-on from their EHR vendor. 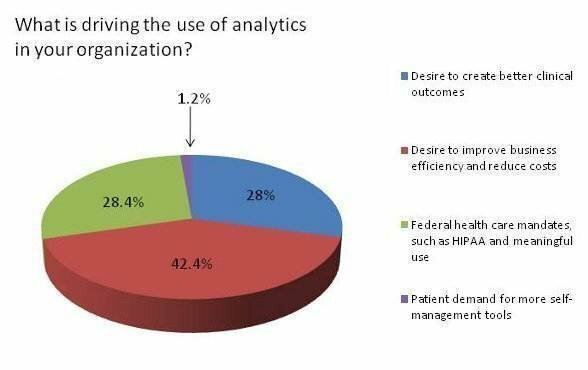 In general health care organizations are not using the cloud for analytics, with only 21% and 22% of respondents said they use cloud functions for business intelligence and clinical data analytics, respectively. But the cloud is still emerging as a useful application for other parts of health care. Some 24% of respondents reported they turn to the cloud for data storage. The need to store an expanding archive of medical images is increasingly driving some health care providers to turn to cloud services. Many hospitals' data centers are already crowded; advances in scanning technologies mean they will have an ever-mounting volume of data to maintain. The cost of managing, cooling and expanding data centers in some cases is looking less favorable than putting the data into the cloud. In a similar fashion, as the health care industry moves to electronic health records, EHR technology is expected to encourage cloud storage. Let us know what you think about the story; email Jean DerGurahian, Executive Editor.